‘Pedal pubs’ catching on; should you be able to imbibe and ride? So-called “pedal pubs” are popping up in more than two-dozen cities across the country. And in some of those places, riders can sip on an alcoholic beverage while sitting across a bar from fellow cyclists. But what exactly are they? USA Today reports they are sort of like a modern day trolley meets the Flinstones. Up to 16 riders sit across from each other, using peddles underneath their seats to slowly power the quadracycles across city streets. A driver sits at the front of the vehicle, steering it along to its next destination. "It's like being in a parade," bachelorette party attendee Jen Johnson told the paper. Her friends rented one in Madison, Wisconsin and used the vehicle as part of a pub crawl. Or, in this case, they embarked on something more akin a bar bike, pub pedal, or drink drive. Regardless, "We're smiling, they are smiling," she said of how their pedal party was received by onlookers. In Wisconsin, it’s still against the law to actually drink while on one of the mobile pubs, although there is an effort to repeal the ban. But in some states, it’s perfectly legal to ride and imbibe. Houston-based Pedal Party allows its riders to take a drink with them along for the ride. But owner Gene Landry said some commonsense rules still apply. "You can bring cans or a keg, easy-peasy," he said. "Texas is very sort of mind-your-own business kind of state and people (here) like to be able to do their own thing." The bicycle powered pubs are also catching on in cities like Arlington, Minneapolis, Nashville and San Diego. 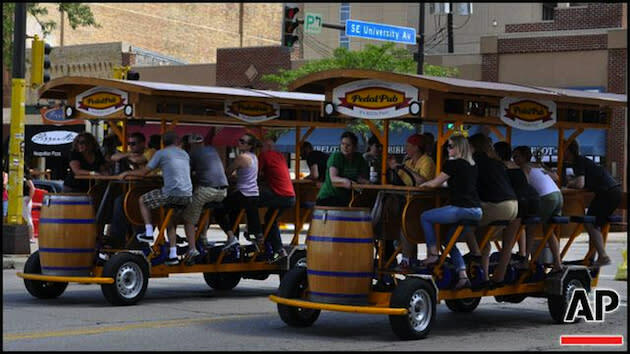 "Different cities have different rules and different attitudes," said Eric Olson, manager of Minnealpolis’ PedalPub . "There's no federal laws regulating it." Olson’s company specializes in guiding tours around Minneapolis. A Florida-based development services coordinator added that the bike pubs are more than a novel transportation route, giving revelers an alternative to driving while intoxicated along with being environmentally friendly. "It's 100 percent green,” Gigi Hart told the Sun-Sentinel. “There's no gasoline involved, it's only pedaling. It's really fun to go from bar to bar on it, it shows that you can party, be healthy and green at the same time." Jeff Stone, a Republican state Representative from Greenfield, Wis., recently introduced a bill that would allow municipalities to allow alcohol on pedal taverns. "In my mind, it's very similar to a limousine or a commercial bus where people can have an open container,” said Wisconsin state Representative Jeff Stone, Republican, who as proposed a bill to change his state’s regulations concerning bike powered drinking stations. “There's a licensed commercial driver responsible for operating the vehicle."